After an overwhelmingly successful first year of camp in 2018… we’re BACK!! This year we are running two summer camps. The first is our back-by-popular-demand Pop-Up Restaurant Summer Camp. The second is our Cook-Like-A-Pro Camp where students take a deep dive into pro kitchen skills. What makes Brooklyn such an exciting place to eat and cook? That’s what students will discover as they transform The Dynamite Shop into a pop-up restaurant devoted to the rich immigrant community that drives our borough’s amazing food scene. Over the course of the week, we'll immerse ourselves in a thoughtful curriculum developed by longtime food-writers Dana Bowen and Sara Kate Gillingham, spending time with talented home cooks, chefs, bakers and cookbook authors from around the world. We will hear the stories behind the foods we'll make, from fresh Italian pasta and Oaxacan tamales to Cantonese dumplings and Russian watermelon pickles. The daily rhythm is active and nourishing. Mornings have us taking on an ambitious cooking project — often with a visiting chef — that results in a bountiful lunch. 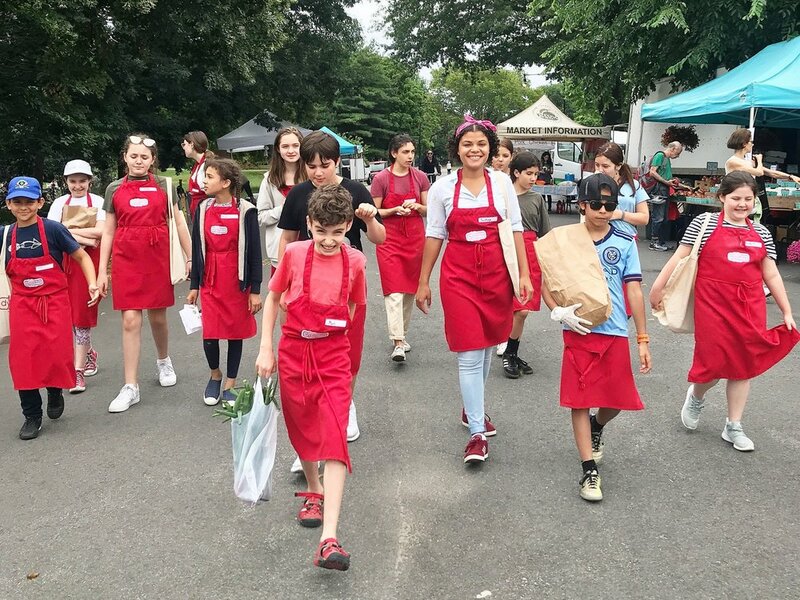 Our afternoons include local field trips to markets and bakeries, more lessons from culinary pros, plus team work on the restaurant concept, from table design to the recipes themselves. We end every week with a food service project and some lively group discussions about how we can do good with food. All camps include daily lunch and snacks. Camps run from 9am to 3pm, with early drop off (8am) and extended day (6pm) available. How to roast a classic whole chicken, make fresh pasta, bake bread, bake a cake from scratch, read a recipe and prep out a meal. Our Cook Like a Pro Camp is designed to help kids become more confident, creative cooks while mastering essential culinary skills. This deep-dive distills the very best pro lessons into one delicious, info-packed week. We devote each morning to savory cooking and essential techniques: while preparing lunch, be it a rich frittata or seasonal pasta (which they'll invent on the fly after a visit to the farmers' market), they'll practice knife work and learn how to taste, season and improvise. Afternoons are all about baking, from bread doughs to pastry to cake decorating. Like all of our lessons at The Dynamite Shop, we contextualize hands-on learning by bringing in chefs and cookbook authors to share their stories. On Friday, each camper will showcase their newfound skills with a meal they’ll bring home for their family. Students receive a personalized apron and a swag bag. Families also get discount pricing on workshops, space rentals, birthday parties and cafe purchases.